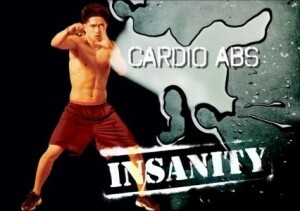 This page is dedicated to the Insanity cardio abs workout. On this page I will try to provide everything you need to know about the cardio abs workout to help you decide whether or not Insanity is the right workout program for you. Once you have read over the full exercise list, please follow the links to the right or browse my Insanity workout page to continue reading about the other DVDs in this program. Or if you think you are ready, click here to take the Insanity challenge today! Insanity cardio abs is the shortest workout in the program at just under 17 minutes for the everything, including warm-up and cool-down. Even so, it was the first one that had me worried I might have to stop and vomit after just a couple of minutes… And despite the name, this is not just an abs workout but a full core workout, which I personally felt more in my lower back than anywhere else. Which brings up an important point – the lower back is one of the muscles in the body that is most prone to injury. Although this workout goes very slowly and there are no sudden, jerking movements that you should have to worry about, pay extra attention to your form and be careful. Injuring yourself at this point could prevent exercise for weeks to come, and essentially destroy all the hard work you have performed in the 2 weeks leading up to the first time you do the cardio abs workout. The warm up starts with jogging and continues with high knees while your arms are held straight up, high knees with a twist of the upper body, jumping rope (without the rope), tuck jumps and wide tuck jumps. At this point Shaun T explains that you won’t be doing any sit-ups or crunches for this ab workout, but trust me when I say that isn’t anything to get excited about. As I mentioned before, despite the short length, this may be the toughest workout to date! Twists – start in c-sit position, bring your hands together in front of your chest and twist from left to right. Twists with knee – basically the same as the twists but as you turn to the left, lift your left knee, and vice versa on the right. A-frame ab twists – start in a c-sit with your hands together over your head. Bring your hands down and to left, then up above your head, down and to the right, back up above your head. Repeat. A-frame with knee – basically the same as the ab twists but when you bring your hands down you bring the corresponding knee up and in between the arms. Hold center – hold a c-sit position with your hands together in front of your chest. Single leg raises – back leg bent, foot on the floor, front leg flat on the ground, palms flat on the floor in front of glutes, c-sit position, with front leg, bring knee in then out, then lift leg up and down. do the same on the other side. High plank alternating knees – start from high plank position (push-up) and alternate between lifting each leg, bringing the knee up toward your shoulder to work your obliques. Start slow and progressively speed up. Low plank alternating knees – same as the previous exercise but from a low plank position (basically the low plank obliques from the fit test). Pulse tucks – from a low plank position, tuck your hips under 8 times. Switch to a high plank position and do the same motion. Repeat. Finally, you will end on a series of cool down stretches and breathing exercises which are similar to the ones performed in the warm up. Hopefully you have found this description to be informative. Ready to get started? Click here to purchase Insanity today.